Cobra-Horn 2 is a floorstanding loudspeaker with a full range driver. 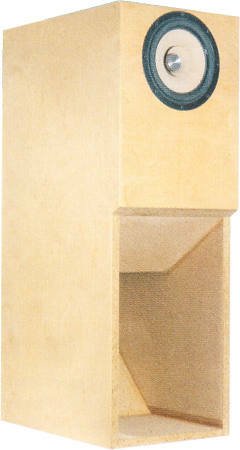 Cobra-Horn 2 is a back-loaded horn loudspeaker with Tang Band driver. The loudspeaker has been developed by Bernd Timmermanns. The frequency response is linear. The decay spectrum as shown in the waterfall diagram is free of any disturbing pronounced resonance. At volume of 90 dB at 1 m, the nonlinear distortions are lower than 1% above 100 Hz. to be mounted on a small wooden board. The high-end kit is delivered with a copper foil coil for minimizing microphonic effects. - The current flow through the coil creates a magnetic field which sets the reel of wire in motion. This motion induces a voltage in the coil which adds itself to the signal. The stiffer the reel of wire is, the less the signal will be altered. The capacitor is a Mundorf polypropylen Supreme Silver/oil capacitor.